Here is your newer, sparkling clean, smoke free, oceanfront rental available for your family for the 2018 summer season! You will enjoy spending your vacation in this reversed living seashore contemporary. We designed it to take advantage of the location and included three decks. The house and decks will provide you with unobstructed Ocean views, Bay views, and views of the Atlantic City skyline. Head to the beach from your ocean front home. All appliances and furnishings are also brand new. Included is a built in surround sound home theater system, 55" LCD TV (Flat screen), and DVD player. All digital service is provided free of charge. The little (and BIG) kids in your party will enjoy the Soft Serve Ice Cream Custard Machine AND the Hawaiian Ice Snow Cone Maker !!!!!!!! The adults will love the fully outfitted, custom made SOLID Maple Bar located in the family room for flawless entertaining ! Located two minutes from all the "action" in Beach Haven, yet secluded in the peace and quiet of Holgate. You will be located a few feet from the wildlife preserve. Families (Pods) of Dolphins FREQUENTLY appear off the Holgate beaches. Last year we even enjoyed a number of Whale sightings off the beach. This is the finest rental available on the Island. Book your Oceanfront oasis now while prime weeks are still available. We have been NJ Residents our entire lives and enjoy spending as much time on the beach as possible. We have been renting on LBI since 1997 and have moved almost 300 families in and out of our properties. Our depth and breadth of experience provides you with confidence that we know how to deliver a vacation home. The location of this property boasts the best of both worlds. Located in a quiet residential area but located 3 minutes away from all the action in Beach Haven. You will have access to the best of all things ! 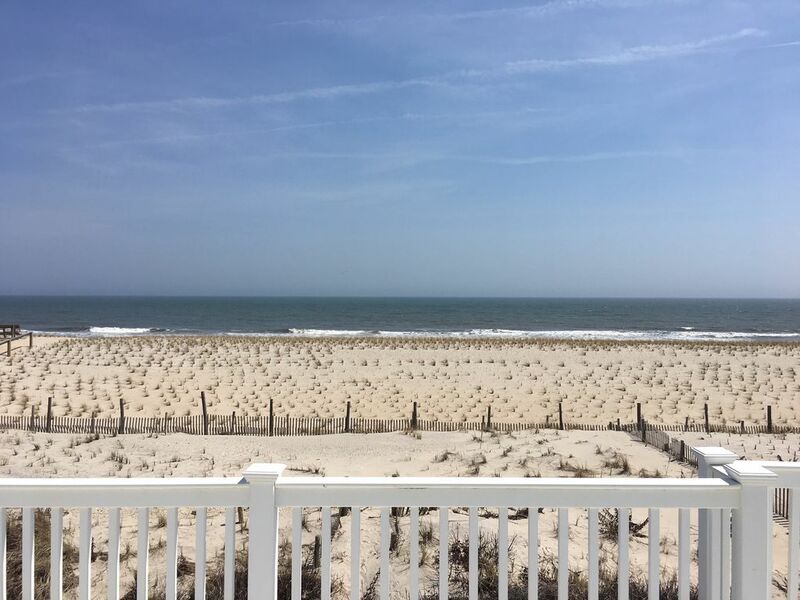 Surrounded by water on three sides, you will have ocean views north to the Barnegat lighhouse, ocean views south to the beautiful Atlantic CIty skyline, and bayview sunsets to the west. Your view to the East is wide open Atlantic ocean ! Clean and beautiful house. I had the most relaxing vacation. The views are unbelievable. The owner was very professional and responded quickly to my questions. I would definitely go back for future vacations. What GREAT tenants. Any property owner would be extremely fortunate to have Patty Peter as their guests. House was left very clean and was very well cared for by Patty and her party. It was a real pleasure having them stay in our home. Quiet life on the beach with spectaclar sunrise and sunset views! This house was organized well. Kitchen and living room area on top with bedrooms and washer/dryer on middle level. Perfect for early risers not to bother the sleepy heads or midnight munchers not to disturb the early to bed crowd. The deck areas off the two big bedrooms were great for sitting or for sneaking up to after using the outdoor shower. The main deck off the kitchen offered spectacular views. Proximity to the beach path was great which enabled you to run back to the house for lunch, snacks or to catch the world cup score! The house was right on a life guarded beach which was another amazing perk. Biking was great. We never tried this home's ice cream maker as the sunset called us for a bike ride and intentional trip to the The Board Walk shop for ice cream. Huge garage area to store car, bikes or sand toys/beach umbrellas. Overall great house and great fun. It was a pleasure hosting you and your family ! Great tenants that took spectacular care of the property. Have a great year and we would consider ourselves fortunate to host you and yours again next season.